The butterfly peacock (also called peacock bass) is and extremely popular freshwater game fish introduced to south Florida in 1984. It is readily caught by bank and boat anglers using a wide variety of tackle and bait that ranges from live shiners to artificial lures and flies. Butterfly Peacock bass prefer live fish and fish imitating baits often used by large mouth bass anglers, but they rarely hit plastic worms commonly used to catch largemouth bass. 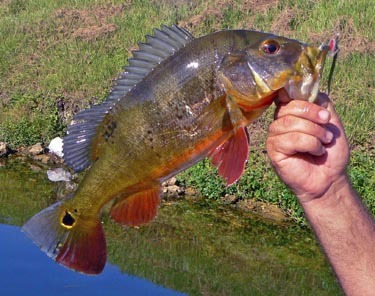 Fishing is typically good throughout the year; however most butterfly peacock bass heavier than 4 pounds are caught between February and May. Shaded areas provided by bridges, culverts and other structures generally are productive fishing spots, along with fallen trees, canal ends, bends and intersections. Nearly all butterfly peacock bass are caught during daylight hours. The easiest way to catch butterfly peacock us by using a live bait. 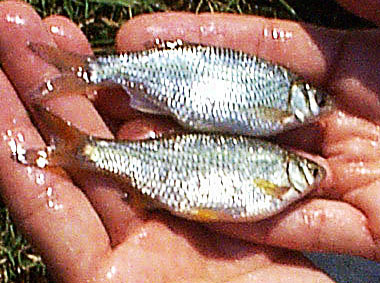 A favorite choice is a small golden shiner about three inches in length, referred to locally as a “peacock shiner.” These can be fished below a float or free-lined while either casting or slow-trolling with an electric motor along canal edges. A small split shot weight may be required to fish the shiner at the proper depth. 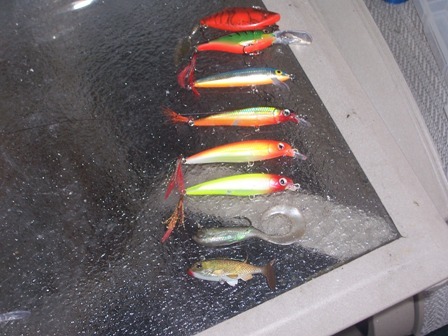 Topwater lures (with and without propellers), minnow-imitating crankbaits and a variety of jigs fished on casting or spinning tackle are good choices for artificial baits. These include floating and sinking Rapalas and Yoziri minnows, Rat-L-Traps, Shad-Raps, Jerk’n Sams, WobblePops, Tiny Torpedos and Pop-Rs. A plastic twin tailed minnow and jig combination buzzed across the surface or tossed at fish sighted in deeper water also can be productive. Small tube lures and jigs frequently are used to sight-fish butterfly peacock bass, especially when they are aggressively guarding spawning beds near the shoreline. Although bigger baits (up to five inches) may entice more trophy sized fish, baits less than three inches will produce more consistently than larger ones. However even big butterfly peacock will take baits smaller than largemouth bass anglers typically use. Dahlberg divers, Deceivers, Clousers, epoxy minnows, zonkers and poppers are all popular selections of flyfishers. Many anglers prefer gold, fire-tiger or natural colored lures; fly fisherman like chartreuse or yellow flies with flashy strips of mylar materials. Most Butterfly Peacock Bass anglers use light spinning tackle with six to eight pound test line. Light lines and tippets generate more strikes that heavier ones and heavier lines aren’t necessary because canal-caught butterfly peacock tend to be open water fighters. The butterfly peacock can be handled by its lower jaw, using the same thumb and finger grip used for largemouth bass, although this will not immobilize them. By the end of the day, successful anglers using this grip will have many minor thumb scrapes caused by sandpaper-like teeth. 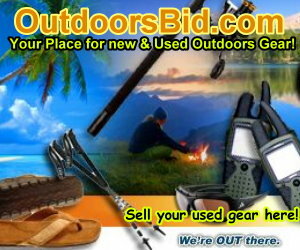 These can be avoided by using tape, a leather thumb guard or a fish landing device like the Bogagrip. The currently bag limit for Butterfly Peacock Bass is two fish per day, one of which may be greater than 17 inches long. This 17-ince length regulation gives added protection to large fish, which is essential for maintaining a high quality sport fishery. If the popularity of butterfly peacock fishing continues to grow as expected, it may be necessary to consider even more restrictive regulations to protect this fishery (e.g., the bag limit may be reduced to one fish). All regulations for sport fish are subject change, so always be sure to check for current rules. The Florida Fish and Wildlife Conservation Commission (FWC) encourages anglers to practice catch-and-release when fishing for Butterfly Peacock. Overall, this species is a hearty fish and nearly 100 percent will survive being caught and released when properly handled. However, butterfly peacock do not survive as well in live wells or as long out of water as do largemouth bass. It is important that they be released quickly to maximize their chances for survival. We will from time to time reprint an article from a Governmental agency such as the FWC to give readers the best possible information. Additional information may be found at www.MYFWC.com and www.floridaconservation.org. We thank them for this valuable information.